Receiving Holy Communion is one of the spiritual stepping stones in the Christian faith. In the early Christian church even infants communed by tasting drops of wine that the priest placed on their tongues. Centuries later that early Christian practice changed, and now children in the first grade or in upper grades commune for the first time. It was the practice of my congregation to offer children their first Holy Communion in the third grade, as I recall. They received instruction before they received this sacrament. On the other hand, younger children still came forward at the moment of Holy Communion in worship for a blessing. I would place my hand on their heads and say the appropriate words for a blessing. But children like to grow up fast. They like to do what their older brothers and sisters do. Such was the case with one little child in my congregation. His older brother had already received his first Communion, and that younger brother wanted to have what his older brother received at the altar rail – the bread and the wine. So one Sunday, as this little child knelt at the altar rail with his older brother and parents, he did something peculiar. As I got ready to lay my hand on his head and say the blessing, he put one hand on his head and reached out his other hand to receive the communion water. I was shocked and yet pleasantly amused at the same time. His mother saw what was happening and gently took her son’s hand from his head so I could give him the blessing. And even though this little child did not receive the bread and wine that Sunday, he still received a welcome from Christ as I laid my hand on his head and reminded him that the Lord will bless and keep him. We eat the bread and drink the wine in Holy Communion, believing that Christ is truly present with his promise for forgiveness, life, and salvation. I have often thought that children should receive the sacrament of Holy Communion as they did centuries ago. After all, it is in faith that we joyfully receive this sacrament. Our reception of Christ’s own body and blood is really not dependent on our knowledge of this mystery. Certainly, as a child grows, there needs to be catechesis to mature in the knowledge of the Christian faith and its practices. Eternal God, fill us with grace as we feast at your table and help us to hold onto your promise for faith and life in this holy meal. “Draw Us in the Spirit’s Tether,” Evangelical Lutheran Worship (ELW) #470. It is Christ who invites us to Holy Communion. Communing, we experience his presence in faith. As we eat and drink at the Lord’s table, we are united in faith to him and to others in the body of Christ. 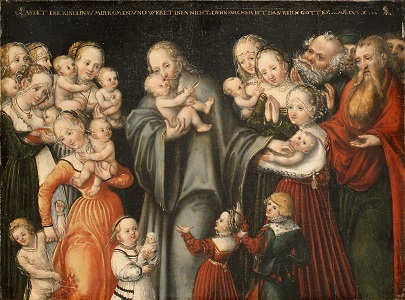 Christ Blessing the Children, Lucas Cranach the Younger, date unknown. In this painting, what is Jesus doing to bless the children? What is the reaction of the children to Jesus? Describe the facial expressions of the mothers.